Meet Gursewak Singh, who is also known as a creative guy with the magic brush! As a part of our ‘Makeup Artists‘ program, we bring to you our first post from the series. 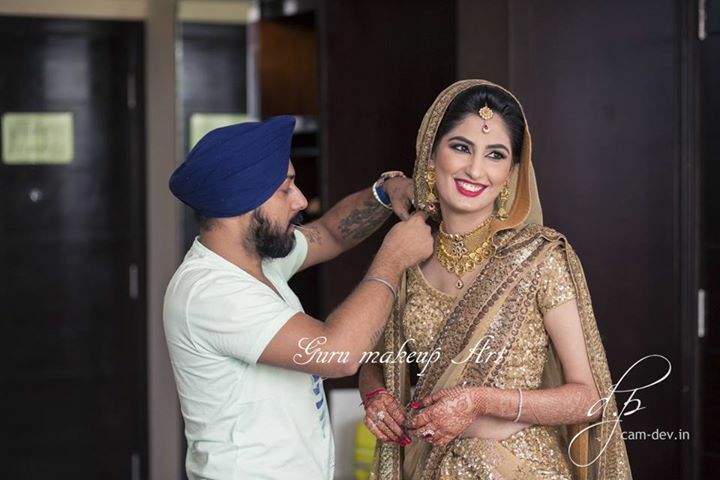 Delhi based Gursewak Singh has earlier worked with MAC and is now a freelance Makeup Artist. He is passionate about colors and beauty. Be it brides or models, Singh is known for his simple yet stunning makeup looks that make them look even more gorgeous. This gentleman has also got a great sense of humor. So, let’s take a sneak peek into his life and get to know him and his work better! 1. What is a day in the life of Gursewak Singh like? My day starts with makeup (reading, watching videos) and ends with makeup. Yes, makeup has been my first and last love after I finished college. I’m a full-time freelance makeup artist. Makeup has become very simple and real these days. There was one point of time when makeup meant layering foundations on your face. But over time trends have changed drastically. The only difference I feel is that the “lighting “for TV/films is different and for brides is more real. I have had so many great experiences while working with different people. I love the confidence I see in someone’s eyes that makeup gives them. It is a feeling which can’t be expressed in words. So far I guess I have been able to achieve a great balance between my professional and personal life. Social media is one of the important factors in bringing about a revolution in the beauty industry. People are more aware of what they like and what they want. It has definitely changed our beauty industry in terms of hair, makeup and beauty treatments. Customers are well educated about the products and services. At some point being a makeup artist I feel this change has been very helpful. My signature look is simple, with a ‘less is more’ policy yet glamorous. Makeup is all about enhancing the features, not painting layers. Wanting to look lighter than what their original complexion is is the most common mistake that I have come across. People till today have an obsession of looking white! The next big mistake I have noticed is drawing the eyebrows with a pencil and not blending it. This leaves harsh lines and looks most unnatural. The third blunder that many women make is not taking off their makeup before going to bed! Remember, your skin needs to breathe, and the best time for it to do that is when you are asleep. Mickey Contractor and Dany Sanz are two people who inspire me everyday. If you are good and passionate about what you do, no one can stop you!